A & M and m and s and k: Just Keep Running! We did it! What did we do you ask?! Alec and I ran the marathon and 1/2 marathon together! It all started with a once in a lifetime achievement of me waking up @ 5:00 a.m.! (those who know me are probably shocked and extremely proud of this accomplishment in and of itself, I know I am!). April has become a very special month for us. We started dating in April, Alec recieved his Liver Transplant in April, and now we finished our first big race in April. The marathon was on April 17th, 2010, which was a significant date since Alec was first called into the Hospital for a possible transplant, on that day a year ago. We REALLY had something to run for, the gift of life that Alec's organ donor gave us. Thank you, thank you, thank you! We just wanted to document a few things about this wonderful experience. 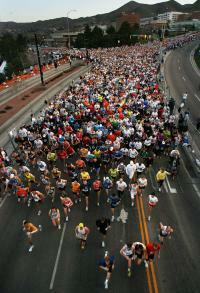 Our favorite part of this process was being among the 11,000 runners (all of whom I know had a special reason to run). We were smack dab in the middle and it was a beautiful and overwhelming site to look ahead and behind us at all of the runners. We turned down 21st south and glanced back to notice the morning sun creating a little halo over all of the runner's heads. 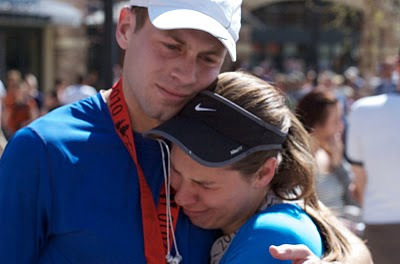 We both got a little emotional looking at this site, and after holding hands for a brief moment we seperated at mile 5 when the half marathon and marathon split. I have to admit it was a little difficult at first not running side by side with my sweetheart but it gave me strength knowing that I was the one running the 13 miles and not 26! What a relief! 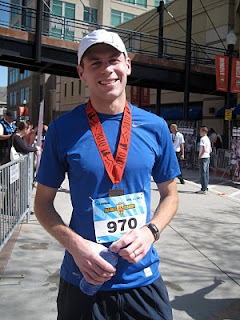 Alec enjoyed the whole experience but also admits that the uphill stretch from 900 S to South Temple (mile 12 for half, mile 25 for full) along State Street is more of a death march than a section of marathon. I often refer to that section as "the beast." We both ran about an 8'13" mile for the first 9 miles, both got a little slower in the middle, and finished strong. I loved finishing strong with a 6'10" mile (believe me, this time surprised me!) and Alec finished with a 7'20 mile only to be greeted by my loving and supportive in-laws at the finish line. After a brief celebration of my finish I was able to go back with the fam to find and run along side Alec for about a mile. A little later in the race his sweet lil sis Micah sprinted to give him a banana. Alec is absolutely amazing!! 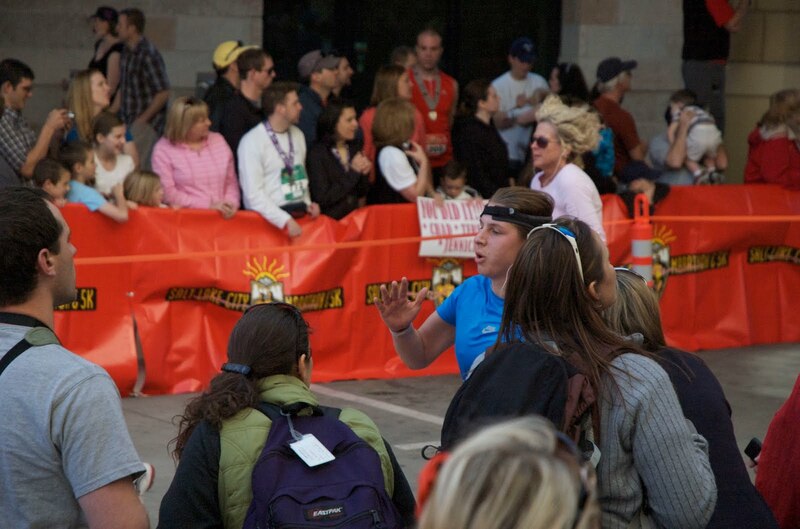 He considers mile 22 "the wall" and it was the perfect time for us to greet him and cheer him along. 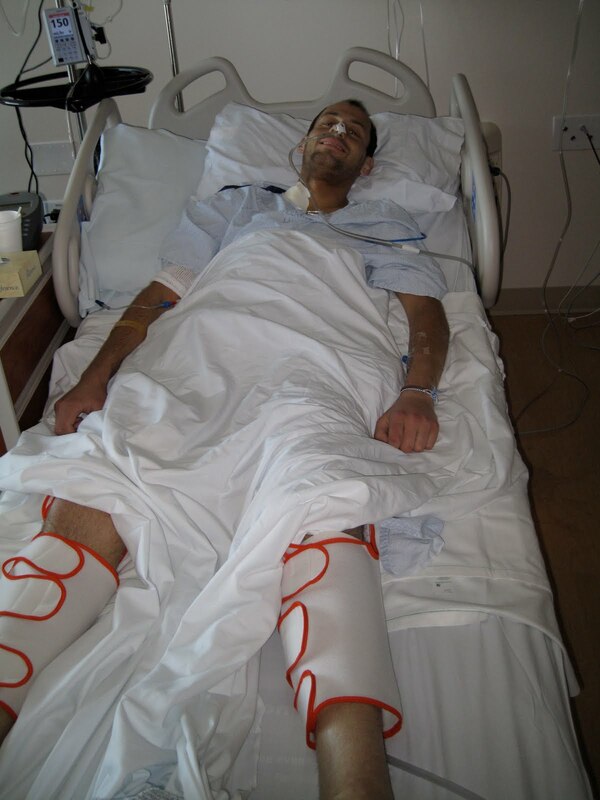 His motivation and strength came from the amazing support from friends, family and loved ones, especially his DONOR. As soon as he finished "the beast" it was all adrenaline from there. 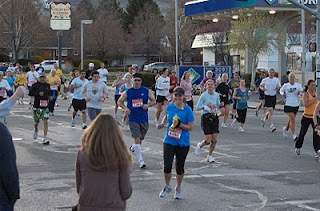 I waited right before the gateway entrance to run along side of him to sort of finish our little journey together, snapping pictures and filming his finish. After a quick flashing of his scar, he said to me, "I'm outta here." He bolted to the finish line not once looking back. 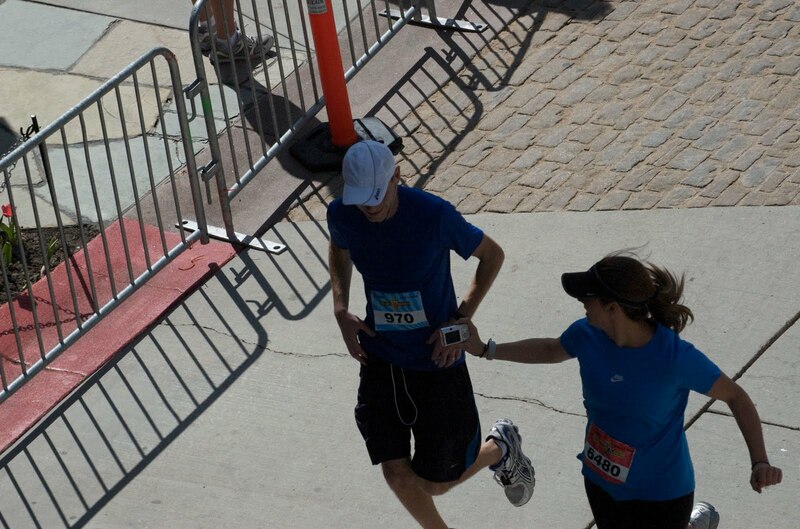 I was teary-eyed watching him step over the finish line. What an accomplishment for the both of us, but especially him. The events of the past year all came together in a second as it donned on me that we accomplished so many things together in our young married life. The Rampton family hugged and congratulated him and I just started to bawl. "I'm so proud of you, I'm so proud of you!" were the words I muttered over and over while nestled into his shoulder. He is my hero! I am excited to say that there is a little news column about his transplant and marathon experience in the Deseret News today. I am thrilled to have this experience documented in the paper because I wish we had known a little bit more about the transplant process and success stories. Hopefully this article can provide peace, comfort and education to those who need it. I am also eager to one day show our little kids that article and tell them that their daddy is superman. We are fortunate for such a positive outcome and realize that it isn't always so. We feel a deeper sense of compassion towards others and their own personal trials no matter how big or small. All in all, Alec just wants everyone to know how important Organ donation is. He is a walking miracle today, and ONLY accomplished this marathon because of someone's decision to be an organ donor. We have never met the donor family, but sincerely pray that they are aware that their loss wasn't in vain. We will eternally be grateful for this gift. To Alec's donor: I will always love you. I can't ever look at Alec without thinking of you. We have many years to look forward to together because of you. We will think of you always, but especially in the springtime, when everything comes to life . . again. I hope by now, at least, you know how much we love both of you. You've packed more living into the last couple of years than most do in a lifetime. Thank-you for your examples and your testimonies. I love all the pictures, they are so sweet. Way to go you guys. Such and incredible year for you guys. I cry everytime you blog about all this. I am so happy for you guys. WOW - thanks so much for sharing this amazing story and the both of you with us! Hope you know of our love and admiration for who you both are and what you have done together. CONGRATS! You both are amazing to me. And not just because you can run that far. Thank you for being such inspiring people! I am sitting here crying, I am so touched by your perspective, attitude, and graciousness toward life. I feel very privileged to know you both--you make me want to cease the day! Love you!